Summer is a great time for having fun with your family. There are a ton of fun activities you can try out in summer – you can go on road trips, try out adventure sports, try a new hobby together, or go and chill at the local pool. And chilling in the pool isn’t just for adults, your baby can join you in the pool too. Depending on the rules of pool, you can take your baby swimming with your, provided you have baby floats with you. Baby floats are specially designed body floats meant to help babies float, swim and relax in the water. They come in many cute shapes and colors that make babies love them and this helps them relax in the water even more without feeling afraid. 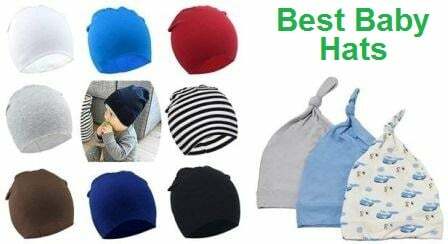 Read our latest guide about the best baby hats. Establishing good swimming habits in your child early on can go a long way into keeping them healthy and fit in the future. Swimming is considered one of the healthiest sports by several fitness experts as it helps increase your strength, stamina as well as suppleness. Hence, getting your child in the habit of swimming everyday will help in developing the habit of exercising regularly for life. This will help them keep away from a wide variety of diseases caused by lethargy and not exercising. Swimming is also a competitive sport, and learning about it early on will help your child learn about winning and friendly competitions. Hence getting a baby float can go a long way into helping your baby develop and grow. But when it comes to choosing one, you may feel confused about which one to get because of all the choices out there. And like everything else, you may feel compelled by love to get the best baby float for your baby. This guide will help you choose the best baby float in the market. But before buying one, lets take a look at the basics of baby floats. Baby floats are all usually made from plastic or silicone and are filled with air to help your baby stay afloat. These baby floats come in the following categories. The life vest styled baby floats are exactly what their name indicates. They are shaped as a vest and inflate up to help your baby float via pulling up the body. These kind of baby floats prevent extra pressure on the neck or waist caused by ring shaped floats. While these may not be the best for swimming, they are excellent for carrying whenever you wish to let your baby have some fun floating around and relaxing in water. These are also the safest and some models can even be used in beaches. Playhouses are floats which let the baby rest on water while keeping their feet underwater, and also have some toys/games on board to let the baby play with. These are perfect for summers when you want to let your tiny tot make the most out of their childhood bliss and happily play and pedal in the pool. These baby floats sometimes also come as rides for the baby to sit on and enjoy the environment. The swim trainers are made of two floats for the arms, and sometimes one for the body. These are meant to help your baby learn to swim without experiencing the fear of drowning. You can consider them the training wheels of swimming. These floats allow free motions so that your toddler can learn to paddle and swing arms without any restraints and develop into an amazing swimmer. Now that you know about the basics of baby floats, it’s a good idea to look at some of the qualities the best baby floats in the market possess. When you look for the perfect float for your baby, it’s a good idea to look for the following qualities in it. Most baby floats are made of an EVA foam, while others are made from a silicone-plastic tube and most are covered with fabrics to make them look cute and fun to play with. The foam type floats are usually considered more durable than the silicone ones since the latter have the potential of getting punctured by a sharp object. 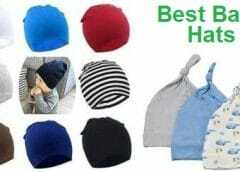 However, this weakness can be overcome with a fabric cover over the tube. Babies don’t handle direct sunlight too well and hence need a Sun Protection Filter (or SPF). Just using sunscreen on your baby’s skin won’t be enough to filter out all the UV rays and that’s where a baby float with a canopy comes in. The canopy will shade your baby like the roof of your home and will keep the UV rays away. Safety is the primary reason to buy a baby float – you want your baby to enjoy in the pool while being safe. The safety that these floats provide is good, however, you still need to be near your baby at all times. Still, there are some extra safety features you could look for in a baby float. These include – a leak proof valve, a sturdy strap, backup seals and balancing weight. These features will keep your baby upright in case of any and all accidents and give you enough time to lift your baby off the float and into safety. The size of your baby float should match the size of your baby. Some baby floats even expand as your baby begins growing and hence, they remove the need to buy another float when your baby outgrows them. These also sometimes come with detachable parts for when your child becomes an experienced swimmer. Besides being safe, the baby float should also be comfortable enough for your baby. The spine of a baby isn’t well developed and hence they need support to sit up straight. And the float should provide enoug h cushioning for them to do so. Besides, if your baby isn’t able to sit up yet, the float should allow for them to lay and relax without breaking balance or going too deep in water. This feature is more for you than your baby. You probably won’t take your baby swimming all year round and hence will need a float that is easy to store out off season. Some floats are dismantlable while others can be deflated and stored in a small box. Now that you know what to look for in a baby float, you can buy a float for your tot without much confusion. Just be sure to match the above requirements with your baby’s and don’t use it as a strict checklist. 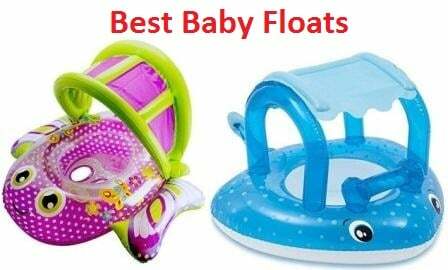 Given below is a list of some of the best baby floats in the market and you can feel free to choose one of them for your baby. The V Convey Baby Float is meant to make taking your baby to the pool a completely stress-free experience. This amazing baby float is made from latex foam on the inside. Latex foam helps keep your baby afloat without having to worry about inflating your float every time you go to the pool. The foam will keep your baby afloat without any air as its density is much lower than that of water. Some doctors may advise to avoid letting your baby’s skin touch latex as it may cause an allergy. However, this float comes wrapped up in a super soft and solid swim cloth. The cloth will not let your baby’s skin get in contact with the latex and let your baby splash around happily. This is one feature that is missing from this baby float as it does not come with any canopy. It is shaped like a life vest and functions similar to one as well. Hence if you plan to take your baby to the pool on a sunny day, you will need to use a high SPF, waterproof baby sunscreen. The lack of an SPF filter isn’t much to worry about in this case as it still covers a major percentage of your baby’s body and hence only the face, arms and legs need sunscreen. The baby float is designed for safety and will keep your baby safe and upright even in a wave pool. It keeps its center of gravity downwards at all times to avoid flipping over and comes with sturdy straps with leg support to make sure that your baby can swim and that you can also relax in the pool. However, be sure to be near your baby at all times since a floating device can never match the safety your watchful eyes can provide. This float is sized for babies of 4 months to 2 years and hence can last you a long time before you have to buy a new one. The baby float also comes in 3 colors and looks super cute, perfect for babies. The float’s latex foam is super elastic and will support your baby in water with extra support on the arms and legs. This lets your baby float around, splash and play happily in the pool. The arm support is also designed to assist your baby in playing with toys while in the pool. The baby float does not come with an option to deflate, but it is very small – 18”x19” and can easily be stored in a drawer or cupboard. The punada Baby Pool Float is a great for letting your baby play in the pool without getting sunburnt. 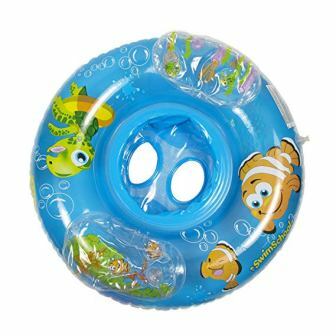 This baby float is made from non-toxic, and toughened PVC to help your baby float and enjoy playing around in the pool. It is designed to hold a baby of up to 44 lbs. and is extremely sturdy. The non-toxic PVC helps make sure that even if your baby bites the float. The sturdy design of the PVC float ensures that air leakages don’t happen. The soft PVC breezes against your baby’s delicate skin and does not cause any allergies or reactions. The baby float comes with a special sun roof to help protect your baby from the harsh UV rays. It is shaped like a boat and allows for your baby to relax in the pool without feeling the heat from the Sun. The canopy is detachable and is supported by two sturdy handles. With this baby float, using sunscreen isn’t necessary, however you must still apply it or when you take your baby out of the water. 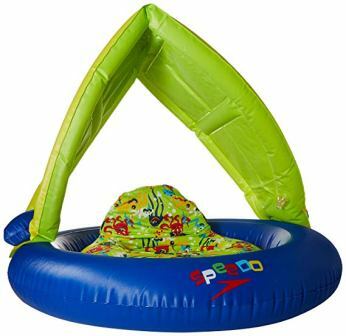 The punda Baby Pool Float has been designed while keeping safety in mind and hence it comes with a unique shape that prevents it from tumbling over. The baby will stay in the center of the float at all times and hence will be able to enjoy splashing around without keeping you stressed about safety. Just be near your baby and you can relax in the pool and talk to your friends while your baby enjoys the pool. The float comes in two different sizes, one just for the baby and one for both the baby and you. 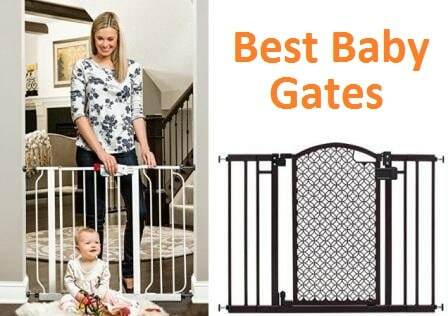 This larger size is great as it will make sure that your baby is next to you all the time and you can play with your baby while using this float. When it comes to comfort, this baby float will leave you baby as a bundle of smiles. It comes with a cute little steering wheel and horn to make your baby feel like a ship captain. You can detach the canopy on the baby float when you wish to store it, and also deflate all the air out of the main body. The SwimWays 11649 Baby Spring Float is a great baby float to help your baby get accustomed to water. This baby float is made from a unique and sturdy mesh fabric on the outside and a patented spring system on the inside. The mesh is super soft and will keep your baby cozy in water while its leg holes will give plenty of room to splash around. The inner spring system is designed to help your baby float and even try to jump, and perform rapid movements without getting you stressed about safety. The float will make the water introduction process a lot more fun for both you and your baby. The baby float has a 50+ UPF Sun filter canopy that will protect your baby from the harmful UV rays and also make a great shade from the heat. This canopy is also detachable and you can remove it when you want your baby to enjoy a little sunshine, but be sure to use a sunscreen first. It is sturdily supported by a frame. Safety is guaranteed when you use the SwimWays baby float for your baby. It has an internal spring system that prevents the float from flipping over and keeps the center of gravity in the bottom of the float. You can shake the float around to make your baby enjoy the water even more without having to worry about safety. It also has dual air chambers to combat an emergency leak, along with child safety valves to guard them. The baby float comes in one size which is suitable for babies of 4 months to 2 years and in 4 different colors. It only lets your baby’s legs go in the water and hence can only carry babies of up to 2 years. The soft mesh fabric of this float lets your baby sit comfortably in it and play around. It has enough room for a toy or two and the fabric is anti-allergenic. When you need to store the baby float, you can detach the canopy and deflate it for easy storage. 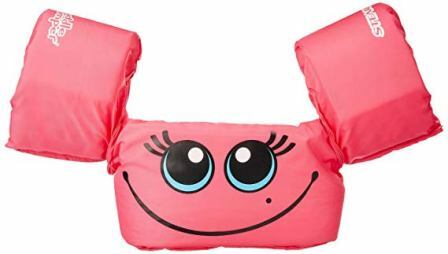 The Stearns Puddle Jumper Basic Life Jacket is an amazing baby float for keen swimmers and will let your baby train in swimming without feeling afraid of drowning. The baby float is made from an USCG approved polyester material which is toughened to ensure your baby’s safety. It has a patented Crosstech floatation foam inside and has a very low density. The polyester is non-toxic and anti-allergenic and it can hold a baby of 30-50 LBS. All this ensures that your child has all the floating taken care of and can focus on learning to swim on their own. The design of the float allows open arm and leg movements for swimming and also helps make the learning process faster and easier. The baby float does not feature a SPF filter and hence will require you to apply sunscreen on your baby before visiting the pool. Most sunscreens may dissolve in the water, hence be sure to use a waterproof baby sunscreen. The float does, however, cover the upper body and arms of the baby and will block off the UV rays there. When it comes to safety, this baby float is designed like a life vest and it serves that function too. 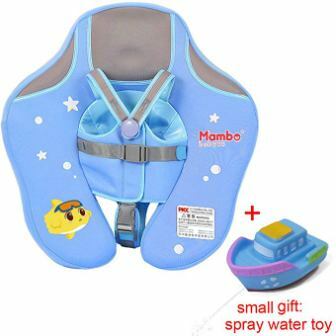 It is made to keep your baby afloat even when they get tired and cannot keep moving their arms and legs to stay afloat. The baby float contains Crosstech floatation foam which makes it less dense than water and also removes the need for air, thereby eliminating accidental leakages. The sturdy polyester is also not easily punctured and will keep your child safe in the water. But be sure to offer adult supervision at all times. The float comes in one size that can carry babies between 30 LBS and 50 LBS, thereby making it easy to use for all enthusiastic swimmers. The polyester is super soft and anti-allergenic which makes it great for using on your baby. It also comes with an adjustable strap that makes the float even more comfortable. Storing the baby float is super easy as it is very small in size. You can just fold it up and keep it in the provided bag. 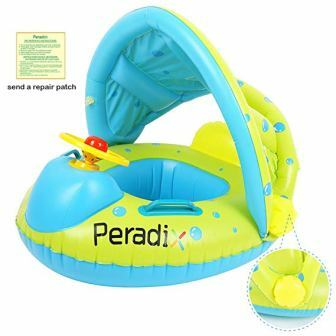 The Peradix Baby Float is a great summer buddy for your tiny tot. The baby float is made from a special PVC to ensure that your baby stays afloat and upright at all times in the water. The PVC is non-toxic and anti-allergenic which ensures that your baby’s delicate skin stays safe and soft while in the float. It is extremely sturdy and in the shape of an adorable boat with two holes in the bottom for your baby’s legs. 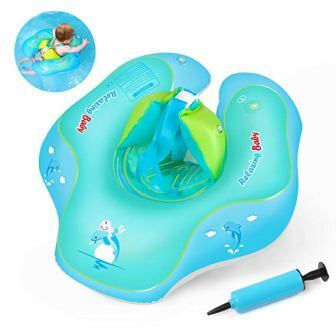 The sturdy design of this baby float will help ensure that both you and your baby have an amazing experience at the pool without the need to worry about drowning. The baby float comes with an adorable SPF sun roof canopy attached to it. This will help protect your baby from the harsh UV rays while also letting your baby relax calmly in the shade. The canopy is detachable and you can take it off to let your baby enjoy a little sunshine. The sun roof makes sunscreen unnecessary, however it is still recommended to use a bit off baby sunscreen, in case you decide to remove the canopy. This baby float is built for safety and will ensure that your baby stays safe all the time. It has a unique valve design to prevent accidental air leakage. Even if you open the valves, it will take two whole days to get deflate the float. It also has two sturdy handles to hold on to the float and the seat is specially design to reduce baby fatigue from sitting for too long. Moreover, its center of gravity makes sure that your baby stays upright at all times. The baby float comes in one size that supports babies of up to 35 LBS. 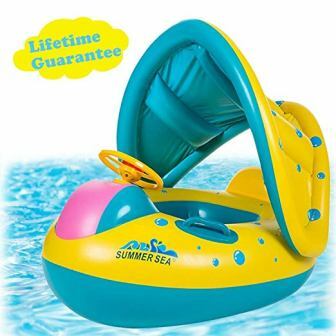 The seat of this baby float is specially designed to be comfortable for long durations, and it comes with an adorable steering wheel and horn to make your baby feel like the captain of a ship. The baby float is easy to store as you can easily detach the canopy and then deflate it using a special tool. This snail shaped baby float is going to ensure your baby stays safe in its shell. The baby float is constructed from a heavy, 10-gauge vinyl to ensure the safety of your baby. This baby float makes playing in the pool and learning to swim feel stress free. The vinyl is super soft, non-toxic and anti-allergenic which makes it perfectly safe for babies, even when they try to bite it. The sturdy vinyl is puncture resistant and is meant to avoid air leakages. The baby float also comes with an adorable flower shaped canopy to protect your baby from harmful UV rays. The canopy, however is very small and some sunlight may pass through the sides and hence it is recommended that you apply a waterproof, baby sunscreen before bringing your tot in the water. This baby float will ensure your baby’s safety in all cases and even if your baby shakes or moves the float, it will not flip over. This is because of its unique design that keeps its center of gravity in the bottom always. All you need to do is stay near your baby and everything will be perfectly stress-free. The toughened vinyl is also designed to avoid air leakages and its valves are connected with an air leak proof system. The baby float comes in one size and can carry a baby of 8 months to 2 years. It is shaped like an adorable snail and keeps your baby safe in the water. The vinyl seat in the baby float is designed to keep your baby upright and help in various fun activities. 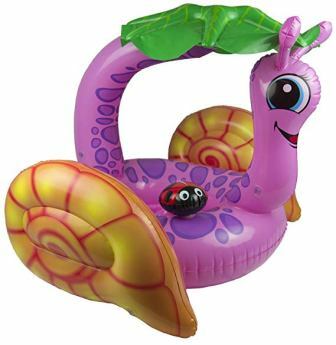 It comes with an adorable lady bug on the float that is meant to make swim-time even more fun. The baby float can be easily stored by deflating it and storing it in the provided bag. The SwimWays Baby Spring Float is an amazing baby float meant to keep your baby afloat and happy in the pool. This baby float is made from a unique and sturdy mesh fabric on the outside and a patented spring system on the inside. The mesh is super soft and will keep your baby cozy in water while its leg holes will give plenty of room to splash around. The inner spring system is designed to help your baby float and even try to jump, and perform rapid movements without getting you stressed about safety. The baby float has a 50+ UPF Sun filter canopy that will protect your baby from the harmful UV rays and also make a great shade from the heat. This canopy is also detachable and you can remove it when you want your baby to enjoy a little sunshine. The soft mesh fabric of this float lets your baby sit comfortably in it and play around. It comes with 5 tethered toys to let your baby enjoy playing with them in the pool without worrying about losing the toys. This baby float is designed by the classic swimwear brand Speedo and it holds up to its legacy. The speedo baby float is made from a soft fabric on the outside and PVC on the inside and is designed to increase comfort and mobility. The Speedo is meant to take the experience of swimming with your toddler to a level of safety and fun that will turn your baby into a wee bundle of smiles. The baby float comes shaped as an adorable sailboat and you can push your baby or teach them to paddle on their own. The canopy that comes attached with this baby float is meant to protect your baby from harsh UV rays and provide shade on hot days. The canopy is detachable for when the day is cloudy or for when you wish to let your baby enjoy a little sunshine, just be sure that you apply a waterproof sunscreen before doing so. The Speedo Kids’ Begin to Swim Baby Float is designed for kids who are just learning to swim and will keep your baby safe in the pool. It has dual inflatable floatation chambers for an added layer of protection in case of an accident. It is also made from a non-toxic material and hence works well with small babies who tend to bite things. This float comes in one size which is perfect for kids of up to 33 LBS. It also comes in two attractive colors. The soft fabric of this baby float will keep your baby floating and happy without any allergic reactions or fatigue. It can be used for long durations without compromising the comfort of your baby. The float can be easily deflated and stored/carried in the bag provided. The Intex Kiddie Float is a cute little baby float for your tiny tot to play around in. The baby float is made from a non-toxic PVC file that is meant to keep your baby safe and sound in the pool water. It is filled with air inside to ensure minimum density and that it stays afloat no matter what. The PVC is child-safe, non-toxic and anti-allergenic which means that even if your baby bites it, there won’t be any consequences. Also, it will keep your baby’s delicate skin soft as ever and won’t cause any harm. 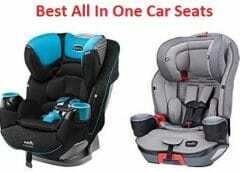 It is shaped like a car and hence has a seat for your baby’s maximum comfort. The baby float comes with an inflatable sun roof canopy to protect your baby from direct sunlight and harsh UV rays. The canopy completely shelters the float and the baby inside and is hence completely safe. You should however, still apply sunscreen on your baby incase you decide to remove the canopy. The Intex Kiddie Float comes with various safety features ready to use. It has dual air chambers for added security during any accident and its valves are designed to minimize air leakage. It also comes with a toughened PVC layer between the air chambers to ensure that they don’t get punctures. The car design has handles to hold on to and the float keeps its center of gravity in the bottom always. This baby float comes in one size only and it can carry babies of up to 35 LBS. The seat of this baby float is designed for comfort and will help your baby be seated upright while in it. The sun roof provides a nice and cool shade during hot days and helps make sure that your baby stays happy. Its arm handle comes with three balls including one rattle ball to keep your baby entertained while getting accustomed to water. The entire baby float can be deflated and stored in the provided bag. The SwimSchool Aquarium Baby Boat is designed to be stable for the young swimming enthusiasts. The baby float is designed with a tough PVC exterior and has a plastic frame ring on the inside. It is designed to be able to keep your baby’s feet under water to get them accustomed to being in water. It will help your baby learn the joys of being in water. The PVC is non-toxic so that your baby will be safe even if they bite it. It is also anti-allergenic and hence is safe for your baby’s delicate skin. This baby float does not come with any canopy or sun roof to shade your baby from the harsh UV rays. This makes it important to make sure that you apply a healthy dose of sunscreen on your baby before going to the pool. 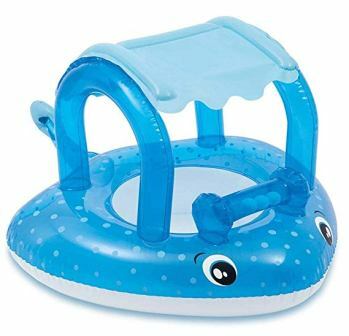 This baby float is designed for safety with its especially buoyant 3-safety seat and unique ring shape. The baby can sit comfortable in the center of the float at all times and hence can enjoy splashing around without keeping you stressed about safety. Just be near your baby at all times and you can relax in the pool too. The float comes in one size for babies of 18 to 24 months. This size ensures that your baby can learn to swim comfortably. The seat of this baby float has been designed to minimize baby fatigue by sitting too long. Its comfortable seat lets your baby stay afloat for a long duration without feeling restless and in all gets your tot accustomed to the water. The baby float can be deflated and dismantled to be easily stored in a box. This unique stingray shaped baby float will make your baby love the water and aid in learning to swim. The Intex Stingray is made from a non-toxic, non-allergenic and sturdy PVC to help make your baby get used to being in the water. Its air-filled design ensures its low density to keep it afloat along with your baby at all times. The toughened polymer is made to get your baby’s attention with its unique stingray shape. This makes the baby float perfect for children who need introduction to the water. The toughened PVC is also puncture proof. This baby float does not come with any sun protection roof or canopy to shade your baby from harsh sunlight. This makes it even more necessary to use a sunscreen when you go to the pool. Also, make sure that you use a waterproof, baby sunscreen to ensure maximum protection. The baby float has been designed with safety in mind and employs dual air chambers to ensure your baby’s safety even during an accidental leak. However, it is still advised that you stay within an arm’s reach of your baby to make sure that they are safe and sound. This baby float comes in one size of 40.5”x30.5”x15” which can carry a baby of up to 25 LBS. This baby float’s stingray design is bound to keep your baby happy and comfortable in the water. This will help make sure that your baby gets accustomed to water faster and becomes a great swimmer in the future. The baby float can be easily deflated to release all the air and then be stored in the provided bag for easily carrying it. The WAITIEE RO-12-Y Free Swimming Baby Float is meant for all babies and kids who want to enjoy a nice splash in the pool. This amazing baby float is made from an extremely sturdy PVC material which folds in multiple air chambers to ensure your baby’s safety and happiness in the pool. The PVC is safe for children and its heavy gauge ensures that it has buoyancy and softness. The baby float is also shaped in a way that is designed to help young swimmers realize their potentials. The float is designed to carry kids of up to six years of age and hence is great for teaching your child about swimming. 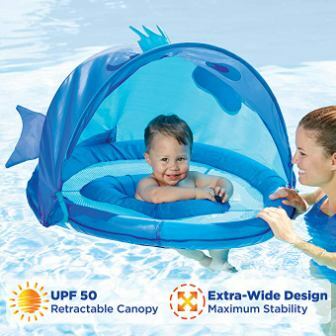 This baby float does not come with a canopy or sun roof to shield your baby from the harsh UV radiation and hence you will have to use a waterproof sunscreen instead. This baby float has double air chambers to ensure that even if one gets punctured in the rare case off an accident, you will still have the other one to make sure that your baby is safe. The safety features of this baby float have been tested for quality and it comes with a one year of warranty. It also comes with a free ready to use inflation pump to make it easier to inflate the float once you are at the pool. This baby float comes in three different sizes – one for small babies, one for little toddlers and another for kids. This makes the baby float suitable for all the young swimmers out who are learning to paddle their feet and are scared of deep water. The seat of this baby float is specially designed for comfort, and it works well in pools, wave pools and in beaches. The baby float can be deflated for easy storage. Just deflate the outer chamber first and then the inner chamber. The Unicorn Baby Pool Float is shaped like an adorable unicorn and helps gets small babies accustomed to water. The baby float is made from a non-toxic and odorless, heavy-duty 0.3 mm thick PVC material which is designed especially for kids. It is shaped like a unicorn which is bound to attract little babies and it is also anti-allergenic to protect the baby’s delicate skin. 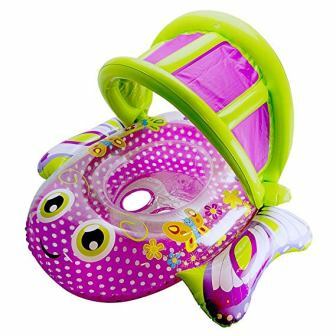 It is meant for shallow waters and will keep your baby happy and interested in water. This baby float does not come with any solar canopy to protect your tot from harsh UV light and hence you need to make do with a waterproof baby sunscreen. 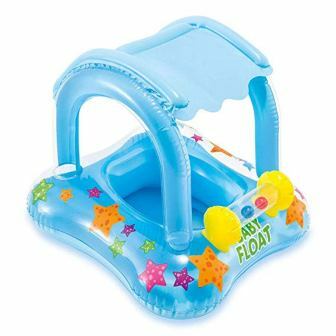 This baby float is specially designed for the safety of small babies and It works like a mini raft. The seat is super smooth and not tight in order to not hurt the baby and it also puncture resistant. However, it is advisable to use it only under supervision and only in still water pools since it is not a life saving device. This float is perfectly sized for small children who need to get accustomed to water or just want a toy to play around with. This can support a child between two and six years of age. 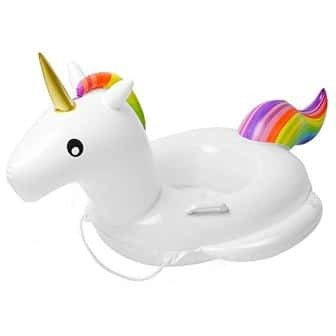 When it comes to comfort, this Unicorn baby float takes the cake as its seat is designed to be comfortable while being in the pool for long durations. The baby float can be deflated to easily store it in the provided bag. This fish shaped baby float is meant to teach your baby to appreciate water and not be scared of it. The baby float is made from an extra soft fabric. This fabric covers dual air chambers for extra buoyance and it is shaped as an attractive blue fish. The baby float fabric is non-toxic and anti-allergenic which makes it perfectly suitable for the skin of small babies. The float is also meant to deliver a feeling of free open movements to ensure that your baby has no problem in learning to swim and paddle. SwimSchool has especially designed this float to get small babies accustomed to the water. 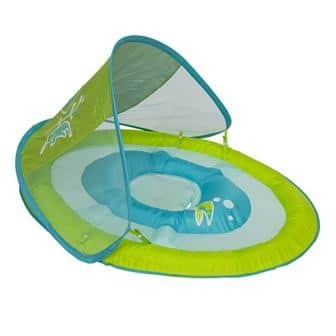 This baby float comes with a retractable and stowable sun roof for 50 UPF sun protection. This ensures that your baby does not come in contact with direct sunlight and is also safe from damaging UV radiation. This float makes sunscreen unnecessary, however it is still recommended for when you take your baby out of the pool water. This baby float is designed with its center of gravity always facing down to ensure that your baby stays upright at all times. The float comes with dual air bags to ensure that your baby can be safe even in the case of an accident and the float does not flip over. This will allow you to relax in peace at the pool while your baby happily splashes around like a bundle of joy. This baby float comes in one size and it can support babies of 6 to 24 months only. The comfort of this baby float is amazing with its super soft fabric and bouncy dual air chambers. The baby float can be deflated and stored away in the provided storage bag. However, deflating it is a bit difficult. This butterfly shaped baby float is meant to introduce your baby to water and make them comfortable without any fear. The baby float is made from an extra soft PVC material in the shape of an adorable butterfly to get your baby interested in being in water. The PVC is non-toxic and anti-allergenic which makes it perfectly suitable for the skin of small babies. SwimSchool has especially designed this float to get small babies accustomed to the water. It allows open arm and leg movements to ensure that your baby has no difficulty in swimming. This baby float comes with a removable canopy of UPF 50 sun protection. This ensures that your baby is safe from the harsh and damaging UV radiation. This float makes sunscreen unnecessary, however it is still recommended for when you take your baby out of the pool water or in case you choose to remove the canopy. This baby float is designed with its center of gravity always facing down to ensure that your baby stays upright at all times. It does not come with dual air chambers but is still buoyant enough to make sure that your baby stays afloat the entire time. However, accidents can still happen and hence, make sure you stay near your baby all the time while in the pool. This baby float is super comfortable as it supports arm and leg movements and can also let your baby splash around the pool for fun. Storing the pool float is easy as it can be deflated and wrapped up in the bag provided with the float.